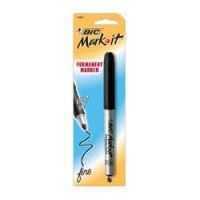 Long-lasting, durable permanent marker offers a rubberized grip for comfort and control and vivid ink for maximum attention. Permanent on most hard-to-mark surfaces such as glass, metal, photos, foils, coated paper and most plastics. Water-resistant and extended cap-off time.